“The Talmud in the Muslim world is considered to be the main source of Jewish iniquity,” she said. “They highlight aspects of it which are not so flattering and put it at the forefront of their presentation of it. Essentially, they use the Talmud as a tool to accuse Jews of certain habits and traits, so it is portrayed as the epitome of the Jewish and the Zionist mentality. And yet, I wondered then and I still wonder now why such immense financial and intellectual resources would be poured into this translation if the intent was merely to propagate anti-Semitic ideas about the Talmud. If the whole thing was just about antisemitism, well then anyone with a modem, the requisite computer savvy to cut and paste, and proximity to Kinkos can produce an impressive neo-classical anti-Talmudic tract within a few hours. Why the official backing of the Arab League, the hundreds of thousands of man-hours, and the purple prose? Soon after the initial announcement, the Talmud Blog got to work. An Arabic translation of the entire Talmud was big news, with all sorts of political, theological, and scholarly implications (just think of how the Talmud can now be brought back to Iraq in the local language, and less romantically, of what this could ultimately do, in a different world, for the comparative study of Geonic and Islamic law). We contacted the Amman based Middle East Studies Center which was responsible for the translation and learned of how much the Talmud set costs (a prohibitive, if understandable $750.00). We then spoke with people connected to the National Library of Israel and Harvard’s Widener library about purchasing a complete set; we found someone studying in Amman who could enquire into whether a single copy might be purchased for a lower price and brought to Israel for Passover (it could not); we had the original advertisement translated into English; with the help of another scholar we discovered a link that contained much of the introductory material online; we were contacted about a working group forming at the National Library to assess the quality of the translation; and mainly, we waited. In the meantime, subsequent news reports moved in two different directions. On the one hand, Aryeh Tuchman, who is an expert in anti-Semitic and anti-Talmud propaganda, found that the introduction to the translation was literally littered with classic anti-Semitic and anti-Talmud tropes. At the same time, the earnestness and unprecedented scope of the project – which supposedly included Christian speakers of Neo-Aramaic – came into relief. A working group to analyze the translation at the National Library of Israel is finally taking shape, and surprises may still await. But where do things currently stand? For one, the ADL machine is up and running. I am well aware that the threat of a major, semi-official Arabic translation of the Talmud backed by official organs of Arab countries is not just an academic occupational hazard. Presumably, the Arabic translation of the Talmud will be the window by which most scholars, Islamic jurists, and plain old curious souls in the Arab world will access this central Jewish text. Accordingly, the ADL has issued a statement that briefly outlines some of the problems of the introduciton, and has even sent a dispatch to the Jordanian government requesting that immediate action be taken. And yet, the way this whole affair went down seems so very predictable: Arabs produce a translation of the Talmud with an introduction that states its aim as an endeavor to explain why the Zionists make life for Palestinians in the territories so miserable. The ADL condemns the translation, op-eds appear in the Jewish press, and we all go home. The fact that just last week, the vice-president of Iran, Mohammad-Reza Rahimi, delivered a totally confused (and, from a certain perspective, hilarious) discourse about how the Talmud encourages Israelis to flood Iran with narcotics (temporarily forgetting that Afghanistan borders Iran to the East) has seemed to confirm this narrative – even if Rahimi certainly did not read the Talmud in translation, Arabic or otherwise. From my view, there is still plenty of room for further reflection on this affair, at least in two related respects. For one, consider for a minute the uses, in certain quarters, of Islamic studies in the West since 9-11. At some think-tanks and research centers, Islamic studies has come to center around a very specific set of questions, especially: ‘why do those turban-heads[sic] blow themselves up in crowded marketplaces and crash themselves into US and Israeli targets?’ The intriguing spiritual and intellectual history of Islam and the central role it has played in the evolution of rationalism (especially in Judaism! ), its startling mysticism, etc etc etc are simply of no concern in those settings. Studying the Talmud to understand the mindset of modern Jews, let alone irreligious modern Jews, let alone the government of Israel, is like trying to understand the mindset of modern Catholics by studying Augustine. A second point has to do with the way the Talmud is described in the ADL press release (and in the Arabic translation!) – “a sacred collection of Jewish law, ethics, philosophy and history.” It is certainly sacred and holy to the countless Jews who gave their sweat, tears, lives, and souls to plumbing its depths. But still, ‘sacred’ is a funny marker for the Talmud to anyone who knows it (or ‘her’, in the traditional androcentrism) intimately. The Talmud is not a pristine collection of canons containing stale legal pronouncements and theological reflections, but something far more dynamic, irreverent, and, sometimes, problematic. I know I am taking a risk here, but one would have be a pious fool to deny the fact that the Talmud does indeed house some of the problematic statements that anti-Semites ascribe to it – just as Patristics and Early Islamic literature offer up plenty of dubious things themselves. Once again, context is key. If some Arabic-speaker living in the Middle East has even the beginnings of a desire to venture into the Talmud’s water with a charitable curiosity, he or she will certainly not understand the Palestinian-Israeli conflict any better. But what just might come into view is the complexity and beauty of a robust Jewish culture in late antiquity – and today. (Incidentally, some of the better Islamic studies programs in the academy have accomplished just that for non-Muslims studying Islam). Just maybe, the very desire that powered a massive translation project to render the Talmud in Arabic will actually engender the beginnings of an appreciation of the rabbinic mind – at least of the 99.99 percent which has nothing to do with the hermeneutics of שבו פה עם החמור. If something like that could happen with the Abbasids, maybe there is still hope today. We are often told that a good scholar has to consistently and continually question the validity of his/her basic assumptions. The problem is that many times an assumption is so inherent to our thinking, that it is easy to mistake it for a universal, objective truth and not an assumption, which is by definition subjective. One way to locate these assumptions, in order to question them, is to look at their “signs” – the habits in academic writing, the terms we use matter-of-factly. Once we shed light on a term of this sort, we can see which view it represents, and ask ourselves whether we can or should justify its use. After all, we all have our writing habits. Some are the fruits of extensive academic training, but others are simply the expression of personal preferences. This seems particularly true when it comes to terminology. For example, some scholars, when writing about Roman Palestine, will use the term “Eretz Israel” rather then “Palestine”. Some will use the term stammaic and others will instead use post-amoraic. There are numerous other examples. Choosing one term over another signifies a (silent) agreement with a certain view, position, thesis, theory, or politics. So, one of my terminological habits, as I realized recently, is to write “redactors” almost each time I refer to the, well, redactors of a talmudic or midrashic text: The redactors of the sugiya, the redactors of the teaching, the redactors of the pericope, the redactors of the midrash. I don’t know exactly when we started using this term in talmudic scholarship but it seems to me a relatively recent convention that some scholars follow quite religiously while others not so much or not at all. I belong to the first group, more or less. I don’t know exactly what it was, but something has drawn my attention to this writing habit, and signaled it as one. Maybe it is the fact that my fellows in the research center, who work on other, non-Jewish and non-rabbinic texts from late antiquity, never use this term when talking about the people who produced their texts. And it made me wonder – what does my and others’ use of the term “redactors” say about our conception of the agency behind rabbinic texts? I realized that when I use the term “redactors” I have two others terms in mind, from which I do not wish to chose – author and compiler. Using the term “author” would assume that there is a person or a group behind the text, that has an intention, a message to transmit. This person or group is “responsible” for the text, and as Michel Foucault has shown, this responsibility creates a subject, who can be admired, criticized or condemned. Using the term compiler, on the other hand, would assume a very feeble agency behind the text. The person or group who compiled a text do not bear full responsibility for it. They have simply chosen all the texts that were available to them and put them together. They do not constitute a subject. 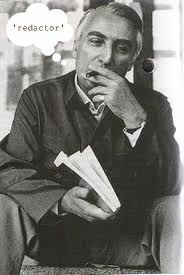 In the terms of Roland Barthes, they are more “writers” than “authors”. The problem is that rabbinic texts are both “authored” and “compiled” – the people behind them had a message to transmit, but at the same time they were compiling old traditions and edited them inside their own text. They did not only represent themselves, but also a tradition that they inherited, as well as invented. In the texts they authored, they had to include teachings for which they were not responsible, even when they did not agree with them. This is perhaps the nature of the activity of those who produced the rabbinic texts, from the level of the midrashic unit, and even the single pericope or saying, to the level of the well developed sugiya. 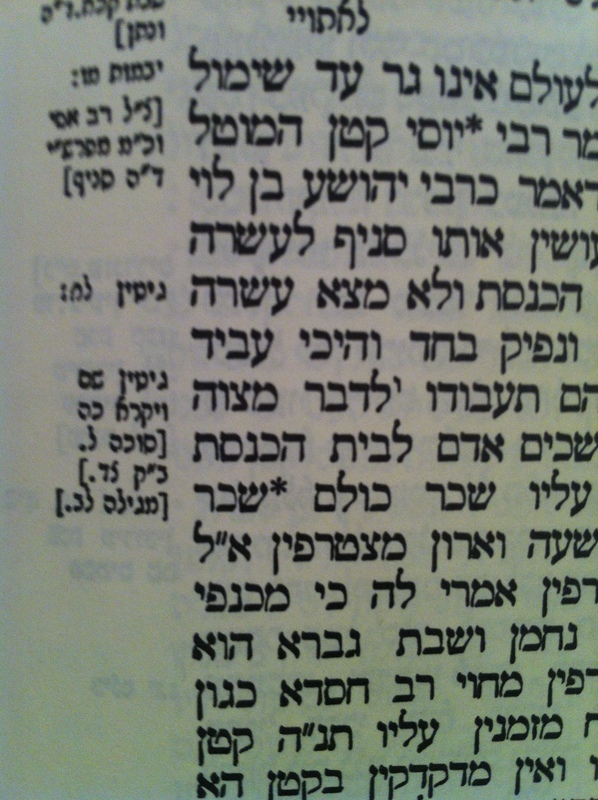 A rabbinic text can be more compiled or more authored, but often it is both. It is a text that has a variety of agents behind it; each one of them is trying to convey a message that has to be understood in a particular context. It is a text which is a battleground, staged by the final redactor, of several views, often including that of the redactor himself. Some scholars, and the first name that comes to my mind is Barry Wimpfheimer, have studied and examined the techniques and methods used by the redactors in order to negotiate between the different views and to create their own legal and ideological narrative. But it seems to me as important and fruitful to think of the activity of the redactor himself in these terms, as a hybrid author/compiler whose job is, indeed, a different job than that of the pure author or the pure compiler. In order to fully understand the inherent tension that characterizes rabbinic texts we have to understand that it reflects a drama inside the redactors’ mind who, on the one hand wants to conserve a culture and on the other hand wants to invent one, or to adapt the old culture to their experience, to their views. The redactors of the rabbinic text always oscillate between tradition and invention in order to create something that is both old and new. Their responsibility for the text is, therefore, multilayered and complex; it is dialectic, as is the text itself. Many people ask me why I chose France when I decided to write my PhD dissertation on rabbinic literature. It is a very good question since there are only a handful of Talmud specialists in this country, and they are hardly read by people outside of France (or inside it for that matter…). France, in that respect, cannot be compared to Israel, the US, the UK or even to other European countries such as Germany or Italy where the situation is somewhat better. I always found this state of affairs very sad. After all, it is a country with a long history of great talmudic scholarship – Rashi and many of the Tosafists, not to mention the scholars from Provence… I’m not saying that no one reads the Talmud in France. On the contrary, there are many yeshivot and community centers where the Talmud is studied in the traditional way. It goes without saying that only or mainly Jews attend these Talmud classes (in some synagogues women can join too). When an academic approach is at stake, however, one seems to go up a blind alley. There are many explanations to this sad state of affairs. Of course, we can go back to the 13th century “Dispute de Paris” with its horrific outcome – the burning of hundreds of Talmud manuscripts found all over the French Kingdom, or the decision to expel all the Jews from France in the following century. But for the purpose of this post let’s stay within the limits of the last century, which, in the very beginning saw the promulgation of the “law of 1905” that decreed the separation of the church and the state, and promoted the value of the “laïcité” (secularism), so precious to the French. The “laïcité” in France is much more than a concept. It is a social and cultural value, whose roots are to be found already in the period of the French “Lumières” that defined themselves against religion in a very provocative and combative manner (contrary to the German Aufklärung). As a proof for its importance one can cite the fact that this value is promoted and used by ALL of the main candidates in the upcoming presidential election, even by Marine Le Pen. Of course, the latter, and to a certain extent all the candidates from the political center, use this value in order to defend the Catholic values that are so imbedded in French culture that no one sees them as “religious” any more. No one, that is, who is from a Catholic background. In other words, as some French sociologists have already pointed out, French secularism is a modern form of Catholic Christianity, in which Catholic values (and customs to some extent) are being stripped of their theological load in order to be presented as neutral, humanistic and universal. In the context of French Academia, the 1905 law had some very significant consequences. Since most French universities are public, the law implied that they could not host departments of theology which in many cases (as in Germany, for example, or in some private universities in the United States) constitute a serious academic platform for religious studies and research. 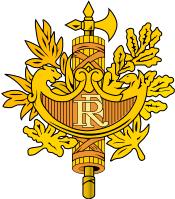 A few such enclaves still exist, as for example in some universities in the Alsace and Loraine Regions that were not part of France in 1905, or in the rare private universities such as the Institut Catholique de Paris. Some fields in religious studies, such as New and Old Testament studies and Patristics, were already imbedded in French universities so that the impact of the law of 1905 was not fatal in their regard. Those specialists found their way to departments of history, philology and so forth. To some extent this is also true regarding medieval Jewish Studies (the first scientific translation of ‘The Guide to the Perplexed’ was produced in French by Solomon Munk in the middle of the 19th century). But as for the nascent field of Talmudic studies, it did not gain enough prestige and importance in order to be integrated in one of these “laic” departments. There were (and still are) departments of Hebraic or Jewish studies in some French public universities, yet most of the specialists that crowded them worked on ancient (biblical, second temple), Hellenistic or medieval Judaism, while the Talmud was for the most part left aside. 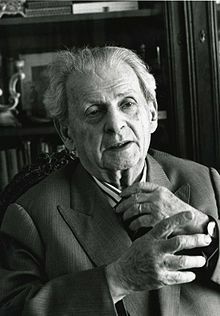 And then there was Levinas. Yet here too, his Lectures Talmudiques were delivered mainly within Jewish circles, and were not viewed as an integral part of his academic work or his philosophy (a trend that may now be changing). Sure, it leads to the fact that we can find some references to the Talmud in the writings of Levinas’ interlocutors, like Derrida or Lacan, but these are by no means the work of specialists, and neither did they influence the heavy apparatus that is the French university to give more importance and space to talmudic studies. The Talmud is still viewed today in French culture as a religious corpus, intended mainly for religious purposes. I am not saying that this state of affaires is unique to France, but I am still always disappointed to find out that in the country of Derrida or Foucault, who wrote the most interesting and rich critiques on western philosophy in the second half of the 20th century, the Talmud, which offers something that can be viewed an anti-philosophical thought, is mostly ignored by the intellectual circles. There is also a very practical aspect to this problem – for the French reader there is no complete edition of the Babylonian Talmud, the Mishnah, or the Midrashim. 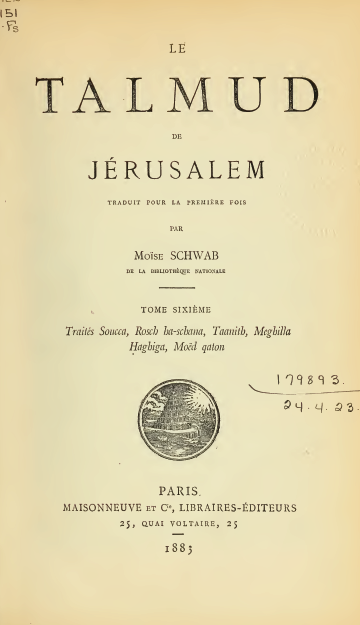 As for the Palestinian Talmud – this was indeed translated in the 19th century by Moïse Schwab, though in an admittedly beautiful (I think) yet highly problematic rendition. The few specialists that are working in France are of course aware to this situation and are working on changing it. The best example is a project I am proud to participate in, which consists of a scientific edition of the Mishnah, and its first complete translation into French – a project led by Daniel Stökl Ben Ezra from the Ecole Pratique des Hautes Etudes. I have to admit, if I chose Paris as the place to work on my PhD on the “ethics of the self” in the Talmud, it was not because I wanted “to bring light to the Gentiles” but mainly because back then I was still under the “spell” of French Theory (which is after all a much more American notion, not to say invention, than a French one). Ever since, I realized how neglected the Talmud is by the rich intellectual discourse that is going on in this country, and I started to refer to my work as a mission, or at least a very important job. Talmudic thought, when studied in its historical context (that is to say not in a Levinasien way), can shed light on many subjects that occupy western societies in general and the French one in particular. Its “realistic” approach (“no law can be imposed on the public unless it can endure it”), its anti-mystical attitude, and its general ethical demand – to live an individual life of virtue without retreating from the social, day-to-day world – all these and other values discussed in the rabbinic corpus can contribute much to the problems French society has to deal with these days. Of course, it will not be possible to integrate talmudic texts into the public discourse here unless we show that they are not more or less “religious” (in the modern sense of the word) from the founding texts of western civilization. This job is still in its infancy, and with some naivety (some may say pretention), I promise to keep you posted on the developments. Ah, finals… In Israel, the period bears multiple names- “bein hasemesterim“, “hufsha“, “tekufat hamivkhanim“, none of which seem to fully own up to the fact that the average BA student has four weeks to complete coursework for around eight classes or so. But enough complaining. 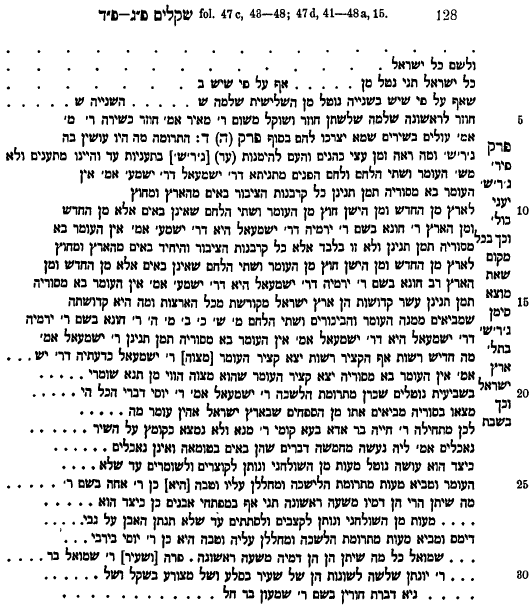 This testing period has had me reading quite a lot of secondary literature on the Yerushalmi, a Talmud which I believe has received relatively little attention here on The Talmud Blog. 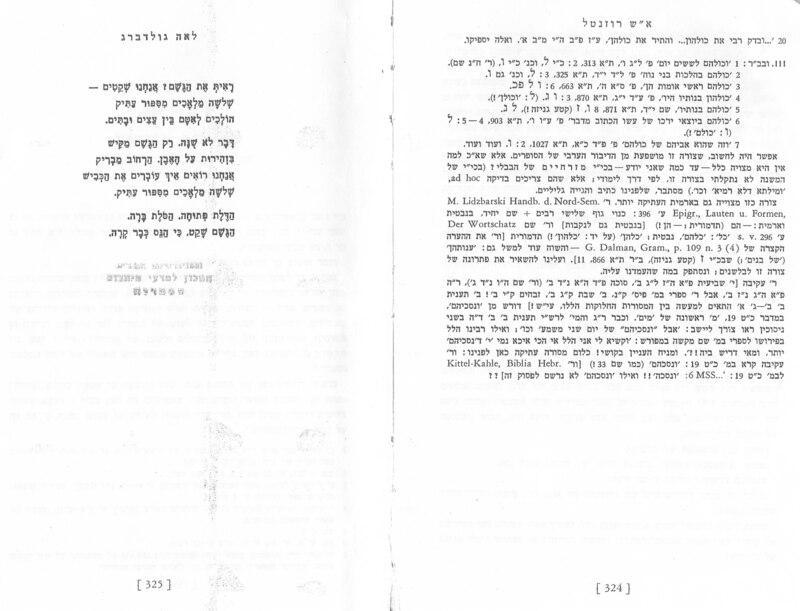 One of the phenomena that I’ve been taken by over the past couple of months is that of the gerashim in Palestinian corpora. E.S. 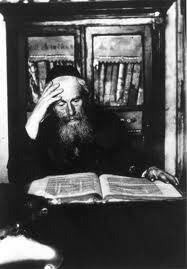 Rosenthal’s pioneering essay on the Vatican 30 manuscript of Genesis Rabbah in the 1958 Agnon festchrift (immediately followed by a classic Leah Goldberg poem) paved the way for the study of this form of referencing parallel sections found in many rabbinic works from the land of Israel. Even though I’ve been interested in this phenomena for a while now, only now while studying for my test on the Yerushalmi did the thought occur to me that this method of referencing parallel passages might be a function of the transmission of the work in the form of a codex as opposed to on a scroll. That is, if those who first placed the gerashim in the text of say, the Yerushalmi, were familiar with the text in a written as opposed to oral form, then it seems likely that they were familiar with it on a codex. Placing keywords to reference other passages doesn’t help so much in the case of scrolls, whereas with a codex one would be able to just turn the page to the passage referenced. Alternatively, maybe those responsible for the gerashim worked in a setting based on the simultaneous use of written and oral transmission of the reciter of the text. Perhaps the work was meant to be read from a written source- be it a scroll or a codex- and then completed from memory at the points in which the gerashim were embedded into the text. 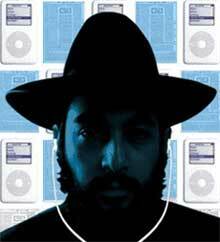 wanting, eclectic and uneven: An occasional Israeli drama about Orthodox Jewish singles living in the Jerusalem ‘swamp’, minimalist Iranian art-house flics, and a film about the Hebrew University Talmud department – that pretty much sums it up. But on a recent trip, after grading some papers and reading a bunch of articles, the illuminated edges of a humming, nocturnal transatlantic flight seemed like the right setting to get myself ‘up to date’ – cinematically speaking. Contagion struck a bit too close to home, given the coughing passenger sitting directly behind me. 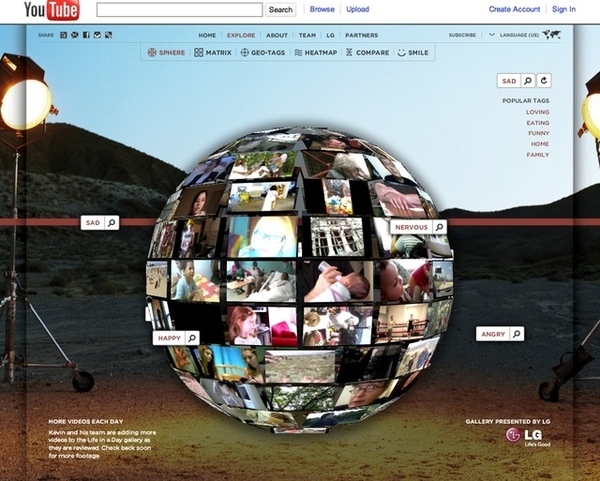 And so it would have to be Life in a Day , the Youtube movie formed from thousands of hours of amateur video sent in from all over the world that filmed life on July 24, 2010. The movie is about 90 minutes long and is a work of art – that is to say, a cultural creation that asks to be assessed primarily for its aesthetic value. Instead of 90+ minutes of typical Youtube fare (inane banter, insane children, deranged dogs), some of the cinematography is quite skilled, and beautiful too. Far more important is the texture of the finished work. It is redaction at its best, with allusive juxtapositions and mournful pairings. A most suggestive craft. Ultimately, Life in a Day asks its readers to consider the relationship between the finished film and the global human society it depicts, as well as the chain of producers and consumers that brought it to life. How does this cultural artifact reflect, represent, and interact with the humans who produced it and who appear within it. And how do other intricately redacted works, like the Bavli, intersect with its numerous communities of reciters, listeners, editors, scribes, and readers? If the Stam sent out video cameras to capture intellectual, ritual, and ethnographic life in Jewish Babylonia, what would the final product look like? I suppose the answer is that it would look like the Bavli as we have it. Historians, especially Jewish historians, love talking about religious persecutions. But what do we mean by religious persecutions of Jews? The other day in class, I spent a bit of time discussing a few lines in a series of inscriptions commissioned by the powerful third century Zoroastrian priest’s, Kirdīr. In the inscriptions, Kirdīr boasts of his many “good” deeds, including persecution of Jews, Shamans (Buddhists), Bramans (Hindus), Christians (perhaps Greek-speaking Christians), “Nāṣrā” (perhaps “indigenous” Aramaic-speaking Christians), “Makdags” (perhaps “Baptists” – and even Mandaeans), and “Zandīgs” (Manicheans). Many Jewish historians have attempted to connect this line to references to “persecution” of the Jews at the hands of the magi preserved in the Talmud, including three decrees attributed to Zoroastrian priests against slaughtering meat, bathing (or perhaps also ritual immersion), and regular burial. More recently, Talmudists (like Richard Kalmin) have called into question the historicity or reliability of some of the talmudic parallels to the inscription. The relevant talmudic passages are heirs to supremely complex redactional histories that muddle their usability for straightforward historical reconstructions. On the other hand, as Oktor Skjaervo has pointed out, this part of Kirdīr’s inscriptions have perhaps been over-interpreted, since most of what Kirdīr writes is couched in traditional Zoroastrian terminology (including this passage’s use of the term zad – “struck down” – to describe what Kirdīr did to these different communities). This terminology is used more to convey an idealized, mythical image of the place of these other religions in the view of a third century Zoroastrian priest than to present an accurate historical picture of real persecution. In class we also juxtaposed the inscription to a passage from the Zoroastrian compilation Šāyest nē Šāyest and saw a similar attempt at creating a catalog of other religions that expressed a certain view of the world, not an historical reality. Even if Zoroastrian priests did actually forbid Jews to ritually slaughter their meat, can this be understood as a religious persecution, that is an act directed at keeping Jews from performing their ancestral laws? Perhaps, as Geoffrey Herman has suggested, the decrees simply reflect a Zoroastrian problem with Jewish slaughter, since the latter casts blood upon the sacred earth. The same could be said in regards to burial which pollutes the earth, and as I suggested in my dissertation, in regards to immersion after menstruation which might be seen as contaminating water. 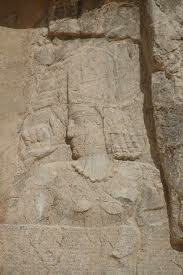 In other words, how do I know Jewish persecution, and “antisemitism” when I see it in Sasanian Iran? An international research consortium to promote the study of antisemitism is launched today (Tuesday 8 November, 2011). The International Consortium for Research on Antisemitism and Racism (ICRAR) involves leading scholars from universities and institutes across Europe, Israel and the US, who share the common goal of revitalising and reshaping the study of antisemitism. The Consortium will promote rigorous, independent research that looks to related fields and other disciplines for insight and embraces new theoretical and methodological approaches. Co-convened by David Feldman, Pears Institute for the study of Antisemitism, Birkbeck, University of London and Scott Ury, Stephen Roth Institute for the Study of Contemporary Antisemitism and Racism, Tel Aviv University, the formation of the Consortium has been driven by concern that the study of antisemitism lags behind other fields of scholarly enquiry. To promote and foster new thinking on antisemitism the Consortium will hold annual workshops and summer schools and produce publications of the outcomes. Its first workshop will be Boycotts: Past and Present. This will be held in London in 2012, hosted by the Pears Institute for the study of Antisemitism. For more information on the International Consortium for Research on Antisemitism and Racism please e-mail: ICRAR@bbk.ac.uk. For better or for worse, as students of antiquity we often keep our distance from these sorts of projects. I wonder, however, if the methodological findings of this consortium’s research centers will have what to teach us about antisemitism in antiquity, and for that matter in Sasanian Mesopotamia.